Boston Marathon bombing suspect Dzhokhar Tsarnaev will go on trial soon. He is accused of launching with his brother the April 2013 attack that killed three people and injured more than 260. Here's what you need to know about his trial. 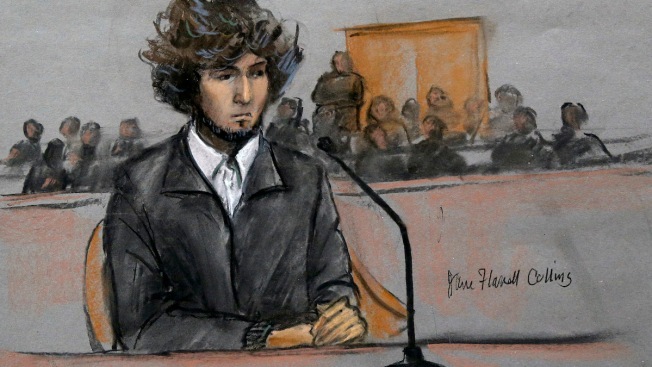 Tsarnaev, 21, faces 30 federal charges in connection with the twin explosions at the finish line of the marathon on April 15, 2013. Three people were killed and more than 260 were injured. Tsarnaev is also accused in the killing of a Massachusetts Institute of Technology police officer days after the bombings. His brother, Tamerlan Tsarnaev, 26, died following a gun battle with police. Prosecutors say the brothers planned and carried out the bombings to retaliate against the U.S. for wars in Afghanistan and Iraq. Tsarnaev has pleaded not guilty. Jury selection began Jan. 5 as groups of potential jurors were called into federal court to fill out lengthy questionnaires. More than 1,350 people took part. Judge George O'Toole Jr., prosecutors and Tsarnaev's lawyers began questioning prospective jurors individually Jan. 15. O'Toole has asked potential jurors whether they have already formed an opinion about Tsarnaev's guilt and, if so, whether they believe they can put that aside and decide the case based only on evidence presented during the trial. The judge and the attorneys also probe prospective jurors on their feelings about the death penalty. To be eligible to serve as a juror in a death penalty trial, jurors must express a willingness to meaningfully consider both the death penalty and life in prison as possible punishments. Six days of jury selection have been lost because of three snowstorms, starting with a blizzard that hit the region at the end of January. Court has been closed two days each week for three consecutive weeks. The court follows the closing schedule of the Boston public schools. On days when the schools are closed because of inclement weather, jury service is canceled. The judge had originally predicted that opening statements in the trial would be Jan. 26, but that did not happen because of the weather delays and a slower-than-expected pace of juror questioning. No new date has been given, though the judge wrote in a Feb. 6 ruling that "substantial progress" has been made toward a goal of finding 70 prospective jurors who are capable of being fair and impartial. Tsarnaev's lawyers have argued repeatedly that he cannot get a fair trial in Massachusetts because of the emotional impact the bombings had here and the many people who have personal connections to the marathon, people injured in the attack and the first responders who helped them. The judge has rejected three defense requests to move the trial out of state. But on Thursday, a federal appeals court granted the defense's request to hold a hearing on the issue. The questioning of prospective jurors — known as voir dire — is scheduled to continue Tuesday in federal court. On Thursday, the 1st U.S. Circuit Court of Appeals will hear oral arguments on the defense request to order the judge to move the trial outside Massachusetts. It is unclear how long the appeals court will take to make a decision. Meanwhile, voir dire will continue. As of Feb. 12, the judge had questioned 183 prospective jurors. He has not said how many of those people have been excused, though it appeared from the questioning that many of them were dismissed because of the financial hardship serving on a lengthy trial would cause, because they had already formed a strong opinion about Tsarnaev's guilt or because they said they would be unwilling to consider the death penalty under any circumstances. Once the judge has a pool of approximately 70 people, each side will get to eliminate 23 people for strategic reasons. The judge has said he will seat a panel of 12 jurors and six alternates.